Katsura is back at it again, this time with a plan to infiltrate the Shinsengumi by going undercover as Hashira Afuro. 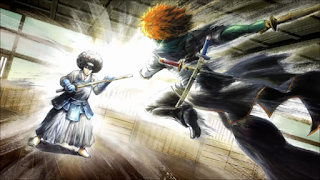 As part of his initiation into the Shinsengumi, Katsura must fight the other memberz, which gets the attention of Kondo, Toshi and Sougo, but that's not all. His getup includes an afro wig and a fake moustache which gets the attention of the Third Squad Captain, Saito Shimaru, otherwise known as Wolfro. Katsura gets into the Shinsengumi, and tells the Odd Jobs trio all about his initiation and his new Captain. But who is Saito really, given the fact that he doesn't talk and spends a load of time on the toilet and writing. Clearly he doesn't do much, but is this truly his character? Well, there is a reason why they call the Third Squad the Silent Squad. It sort of reminds me of Bleach when they big up a character who makes a first appearance and is the leader of a Squad. Saito is the only one in it, and as above he doesn't talk but likes to take a lot of dumps and write, and Katsura seems to find some other secrets about him. Apparently, Saito chooses people to be in his squad who are traitors, and so it seems Katsura is the next in line after a Z gets drawn under his "name" in Saito's diary. Now Katsura tries to find a way to defeat Saito before he defeats him. So Odd Jobs gets involved in all this, but not because of Katsura. Turns out when Saito makes a trip to Odd Jobs it wasn't because he realises who Afuro really is, but rather to get the help of Odd Jobs regarding his lack of social skillz. Saito tries to act on their advice, but bless him it just seems to freak Katsura out even more and make him more paranoid about being found out by the remaining Shinsengumi. This is ends up with him being called a traitor by Katsura, and Katsura rises to the top of the Shinsengumi. I doubt he'll remain a Shinsengumi forever, even though he seems to like it. After all, "Zura ja nai, Katsura da!" Now Saito must undergo a trial to prove his innocence in front of the Afro Shinsengumi, and since he won't talk, Odd Jobs will do it for him. Fun times ahead, and poor Saito falls victim to their improv. But hey, it's one way to get Katsura to reveal himself no? And in the end, Saito feels this is the best way to express himself: to be silent but talk through his actions on the battlefield. Stick to what you do best right? Well, looks like Katsura will forever remain Katsura despite being such an influence by being someone else, and Odd Jobs has helped a client by being themselvez. And Gintama will forever remain Gintama!